Fray Andres de Urdaneta, O.S.A. Fray Diego de Herrera, O.S.A. Fray Juan de Albarran, O.S.A. Rev. Fr. Pacifico C. Nohara Jr. O.S.A. The Basílica Minore del Santo Niño de Cebú (Minor Basilica of the Holy Child of Cebú) commonly known as the Santo Niño Basilica, is a minor basilica in Cebu City in the Philippines that was founded in the 1565 by Fray Andrés de Urdaneta, O.S.A. and Fray Diego de Herrera, O.S.A.. The oldest Roman Catholic church in the country, it is built on the spot where the image of the Santo Niño de Cebú was found during the expedition of Miguel López de Legazpi. The icon, a statuette of the Child Jesus, is the same one presented by Ferdinand Magellan to the chief consort of Rajah Humabon upon the royal couple's christening on April 14, 1521. It was found by a soldier named Juan de Camuz forty years later, preserved in a wooden box, after Legazpi had razed a local village. When Pope Paul VI made the church a basilica in 1965, he declared it to be "the symbol of the birth and growth of Christianity in the Philippines." The present building, which was completed from 1739-1740, has been designated by the Holy See as the "Mother and Head of all Churches in the Philippines" (Mater et Caput... Omnium Ecclesiarum Insularum Philippinarum). The church of the Holy Child was founded by Fray Andrés de Urdaneta, O.S.A. on April 28, 1565, the day when the image of the Holy Child was found in a partially burned hut. More than a week passed after the rediscovery of the image of Santo Niño, on May 8, 1565, Miguel Lopez de Legazpi initiated the founding of the first Spanish settlement in the Philippines. On the spot of the house where the image of the Santo Niño was found, the monastery of the Holy Name of Jesus was constructed. The first church to be built on the site where the image of the Holy Child was found was burned down on November 1, 1566. It was said to be built by Fr. Diego de Herrera using wood and nipa. Fray Pedro Torres, O.S.A. started the construction of a new church in 1605. It was finished in 1626 but was again burned in March 1628. Fray Juan Medina, O.S.A. started the construction of another church in 1628, using stone and bricks, a great innovation at that time. The construction was stopped because the structure was found to be defective. On February 29, 1735, Father Provincial Bergaño, Governor-General Fernando Valdes, Bishop Manuel Antonio Decio y Ocampo of Cebu and Fray Juan de Albarran, O.S.A. started the foundations of the present church, using stone. Since the friars did not have the means to complete the church, they enlisted the help of the parishioners of Opon and San Nicolas to contribute materials, while the people of Talisay contributed labor. 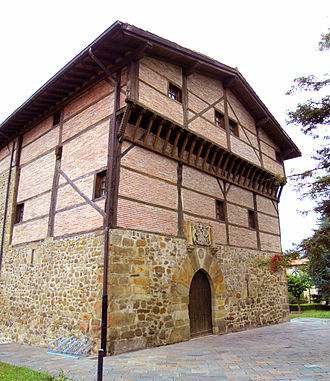 The lack of chief craftsmen and officers forced Fray Albarran to acquire some knowledge of architecture. The church was finished not later than 1739. On January 16, 1740, the miraculous image was enthroned in the new Augustinian church. In 1789, the church underwent a renovation. In 1889, Fray Mateo Diez, O.S.A. did another renovation. The original features of the church have been retained except for the windows which he added. In the 1960s, both church and convent underwent a bigger restoration on the occasion of the Fourth Centennial of the Christianization of the country. 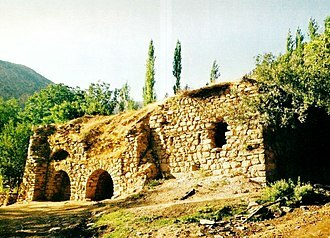 The face lifting was made with utmost respect for the historical character of the old structure. In 1965, Ildebrando Cardinal Antoniutti, Papal Legate to the Philippines, conferred the church the honorific title Basilica Minore upon the authority of Pope Paul VI. As a Minor Basilica, it is given precedence over other churches and other privileges. 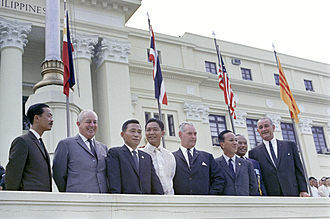 Philippine President Ferdinand E. Marcos also declared it a National Landmark. The Basilica del Santo Niño remains under the care of the Augustinian Friars. The devotees kept increasing over the years and could easily fill the Basilica. To accommodate this growing number of devotees who come to hear mass in the Basilica, a pilgrim center was built within the church compound opposite of the Basilica and Holy Mass is celebrated on Fridays and other Religious Festivities are held here in the open-air, theater-like structure. On October 15, 2013, at approximately 8am GMT+8, a 7.2-magnitude earthquake shook Tagbilaran, Bohol, its force felt throughout the Visayas. It caused more than 120 casualties, and much damage to buildings, historical landmarks and churches. The earthquake destroyed most of the Basilica's belfry and façade; some walls and frescoes were cracked. A video of the collapse can be seen here. The building was soon[when?] restored and later re-opened to the public. The bell tower is now fully reconstructed and the main door of the church as well as the area in between the original church and the pilgrim center is now fully accessible. The museum was first established in the year 1965 by Fr. Ambrosio Galindez, O.S.A. for the purpose of the commemoration of the Fourth Centennial of the Christianization of the Philippines. It was then located at a certain room in the convent. Old church documents dating back to the 17th century, antique church furniture, antique church things (i.e. Chalice, Altar Table, Thurible, etc. ), and antique vestments of the priests are in display. The old vestments of the Sto. Niño de Cebu dating back to the 17th century are also in display. The relics and statues of the different saints are also in exhibit. The replicas of the Sto. Niño used in different pilgrimages in the Philippines and abroad are displayed. Some donated jewelleries and gift toys to the Sto. Niño are in display also. The Basilica del Sto. Niño Museum is currently located at the basement of the Pilgrim Center. Originally for exclusive use by the friars, in the year 2000 the church library was opened to all serious nonclerical researchers. Its collection covers religious subjects and non-religious disciplines including history, science, philosophy, Filipiniana, and periodicals. The Church and Convent of Santo Niño was declared a National Historical Landmark in 1941. In 1965, Pope Paul VI declared the basilica to be "the symbol of the birth and growth of Christianity in the Philippines." In his pontificate, the ecclesiastical document Ut Clarificetur designated the basilica as the "Mother and Head of all Churches in the Philippines" (Mater et Caput... Omnium Ecclesiarum Insularum Philippinarum). The Basílica Menor del Santo Niño de Cebu Basilica Complex is located in city block bordered by Osmeña Boulevard, D. Jakosalem St, P. Burgos St. and the Plaza Sugbo where the Magellan's Cross is located. The main entrance is on Osmeña Boulevard. Two blocks north of the basilica is the Cebu Metropolitan Cathedral, the seat of the Roman Catholic Archdiocese of Cebu. After the 2013 Bohol earthquake. ^ a b c d e f "Basilica Complex". Basilica del Santo Niño. Retrieved on 2013-01-30. ^ a b c "About the Basilica"
^ "Administration". Basilica del Santo Niño. Retrieved on 2013-01-30. Wikimedia Commons has media related to Basilica of Santo Niño (Cebu). Baptism is a Christian sacrament of admission and adoption, almost invariably with the use of water, into the Christian Church generally. The canonical Gospels report that Jesus was baptized—a historical event to which a degree of certainty can be assigned. Baptism has been called a sacrament and an ordinance of Jesus Christ. In some denominations, baptism is called christening, but for others the word christening is reserved for the baptism of infants, Baptism has given its name to the Baptist churches and denominations. The usual form of baptism among the earliest Christians was for the candidate to be immersed, in v.16, Matthew will speak of Jesus coming up out of the water. The traditional depiction in Christian art of John the Baptist pouring water over Jesus head may therefore be based on Christian practice, other common forms of baptism now in use include pouring water three times on the forehead, a method called affusion. Martyrdom was identified early in Church history as baptism by blood, the Catholic Church identified a baptism of desire, by which those preparing for baptism who die before actually receiving the sacrament are considered saved. Today, some Christians, particularly Christian Scientists, The Salvation Army, and Unitarians, do not see baptism as necessary, among those that do, differences can be found in the manner and mode of baptizing and in the understanding of the significance of the rite. Most Christians baptize in the name of the Father, and of the Son, and of the Holy Spirit, much more than half of all Christians baptize infants, many others hold that only believers baptism is true baptism. Some insist on submersion or at least partial immersion of the person who is baptized, others consider that any form of washing by water, as long as the water flows on the head, is sufficient. The term baptism has used to refer to any ceremony, trial, or experience by which a person is initiated, purified. The Greek verb baptō, from which the verb baptizo is derived, is in turn hypothetically traced to a reconstructed Indo-European root *gʷabh-, the Greek words are used in a great variety of meanings. John the Baptist, who is considered a forerunner to Christianity, the apostle Paul distinguished between the baptism of John, and baptism in the name of Jesus, and it is questionable whether Christian baptism was in some way linked with that of John. Commanding a fleet of five vessels, he headed south through the Atlantic Ocean to Patagonia, passing through the Strait of Magellan into a body of water he named the peaceful sea. 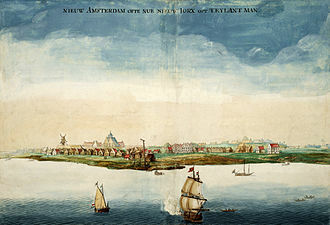 Despite a series of storms and mutinies, the reached the Spice Islands in 1521. Magellan did not complete the voyage, as he was killed during the Battle of Mactan in the Philippines in 1521. 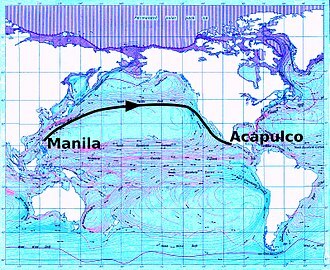 Magellan had already reached the Malay Archipelago in Southeast Asia on previous voyages traveling east, by visiting this area again but now travelling west, Magellan achieved a nearly complete personal circumnavigation of the globe for the first time in history. The Magellanic penguin is named after him, as he was the first European to note it. Magellan was born in northern Portugal in around 1480, either at Vila Nova de Gaia, near Porto, in Douro Litoral Province, or at Sabrosa, near Vila Real, in Trás-os-Montes e Alto Douro Province. 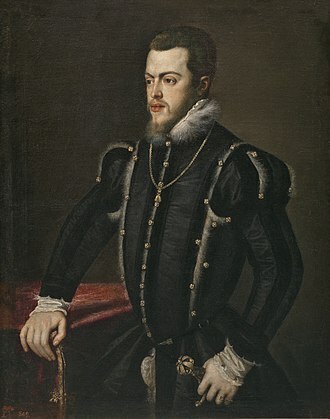 He was the son of Rodrigo de Magalhães, Alcaide-Mor of Aveiro and wife Alda de Mesquita and brother of Leonor or Genebra de Magalhães, in March 1505 at the age of 25, Magellan enlisted in the fleet of 22 ships sent to host D.
Francisco de Almeida as the first viceroy of Portuguese India, although his name does not appear in the chronicles, it is known that he remained there eight years, in Goa and Quilon. He participated in battles, including the battle of Cannanore in 1506. In 1509 he fought in the battle of Diu and he sailed under Diogo Lopes de Sequeira in the first Portuguese embassy to Malacca, with Francisco Serrão, his friend and possibly cousin. In September, after arriving at Malacca, the expedition fell victim to an ending in retreat. 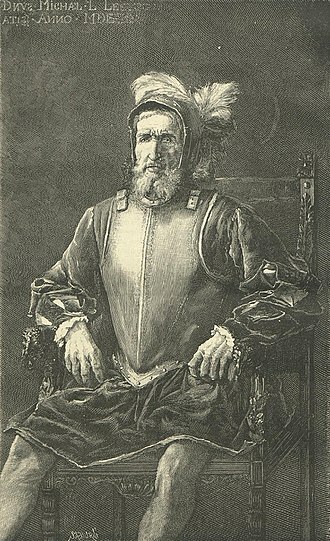 Magellan had a role, warning Sequeira and saving Francisco Serrão. In 1511, under the new governor Afonso de Albuquerque, after the conquest their ways parted, Magellan was promoted, with a rich plunder and, in the company of a Malay he had indentured and baptized Enrique of Malacca, he returned to Portugal in 1512. Serrão departed in the first expedition sent to find the Spice Islands in the Moluccas and he married a woman from Amboina and became a military advisor to the Sultan of Ternate, Bayan Sirrullah. Cebu City, officially the City of Cebu, is the capital city of the province of Cebu in Central Visayas and is the second city of the Philippines after Manila. In the 2016 electoral roll, it had 630,003 registered voters, Cebu City is a significant center of commerce and education in the Visayas. The city is located on the side of Cebu island. It is the first Spanish settlement, the countrys oldest city, and it is considered as the Fount of Christianity in the Far East. Cebu is the Philippines main domestic shipping port and is home to about 80% of the countrys shipping companies. Across Mactan Strait to the east is Mactan Island, Metro Cebu has a total population of 2,849,213 as of 2015, making it the second most-populous metropolitan area of the nation after Metro Manila in Luzon. The name Cebu came from the old Cebuano word sibu or sibo and it was originally applied to the harbors of the town of Sugbu, the ancient name for Cebu City. Sugbu, in turn, was derived from the Old Cebuano term for scorched earth or great fire, before the arrival of the Spaniards, Cebu city was part of the island-rajahnate and trade center of Pulua Kang Dayang or Kangdaya, now better known as the Rajahnate of Cebu. It was founded by a prince of the Hindu Chola dynasty of Sumatra, the name Sugbu refers to Sri Lumays scorched earth tactics against Muslim Moro raiders. On 7 April 1521, Portuguese explorer Ferdinand Magellan landed in Cebu and he was welcomed by Rajah Humabon, the grandson of Sri Lumay, together with his wife and about 700 native islanders. Magellan, was killed in the Battle of Mactan, the last ruler of Sugbu, prior to Spanish colonization, was Rajah Humabons nephew, Rajah Tupas. They Christianized some natives and Spanish remnants in Cebu, the Spanish arrived in Cebu on 15 April 1565. 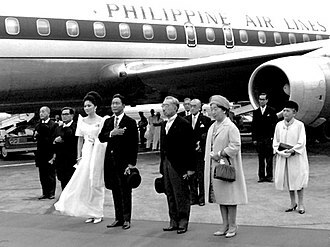 They attempted to parley with the ruler, Rajah Tupas, but found that he. 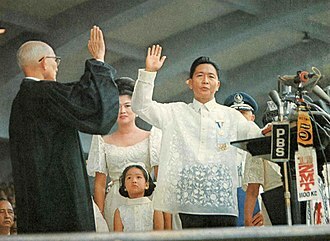 Rajah Tupas presented himself at their camp on 8 May, feast of the Apparition of Saint Michael the Archangel, the Treaty of Cebu was formalized on 3 July 1565. López de Legazpis party named the new city Villa de San Miguel de Cebú, in 1567 the Cebu garrison was reinforced with the arrival of 2,100 soldiers from New Spain. The growing colony was fortified by Fort San Pedro, by 1569 the Spanish settlement in Cebu had become important as a safe port for ships from Mexico and as a jumping-off point for further exploration of the archipelago. The word diocese is derived from the Greek term διοίκησις meaning administration. When now used in a sense, it refers to a territorial unit of administration. This structure of governance is known as episcopal polity. The word diocesan means relating or pertaining to a diocese and it can be used as a noun meaning the bishop who has the principal supervision of a diocese. An archdiocese is more significant than a diocese, an archdiocese is presided over by an archbishop whose see may have or have had importance due to size or historical significance. The archbishop may have authority over any other suffragan bishops. In the Latter Day Saint movement, the bishopric is used to describe the bishop himself. Especially in the Middle Ages, some bishops held political as well as religious authority within their dioceses, in the organization of the Roman Empire, the increasingly subdivided provinces were administratively associated in a larger unit, the diocese. With the adoption of Christianity as the Empires official religion in the 4th century, a formal church hierarchy was set up, parallel to the civil administration, whose areas of responsibility often coincided. With the collapse of the Western Empire in the 5th century, a similar, though less pronounced, development occurred in the East, where the Roman administrative apparatus was largely retained by the Byzantine Empire. In modern times, many dioceses, though subdivided, have preserved the boundaries of a long-vanished Roman administrative division, modern usage of diocese tends to refer to the sphere of a bishops jurisdiction. As of January 2015, in the Catholic Church there are 2,851 regular dioceses,1 papal see,641 archdioceses and 2,209 dioceses in the world, in the Eastern rites in communion with the Pope, the equivalent unit is called an eparchy. Eastern Orthodoxy calls dioceses metropoleis in the Greek tradition or eparchies in the Slavic tradition, after the Reformation, the Church of England retained the existing diocesan structure which remains throughout the Anglican Communion. The one change is that the areas administered under the Archbishop of Canterbury and Archbishop of York are properly referred to as provinces and this usage is relatively common in the Anglican Communion. 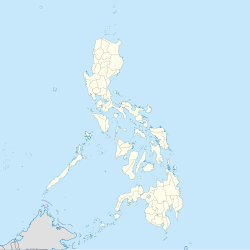 The Metropolitan Archdiocese of Cebu is one of the ecclesiastical provinces of the Roman Catholic Church in the Philippines. 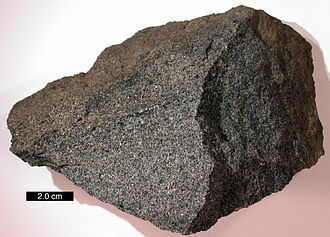 It is composed of the civil province of Cebu. It is the Mother Church of the Philippines, Cebu is considered as the fount of Christianity in the Far East. The seat of the archdiocese is Saint Vitales Metropolitan Cathedral-Parish, the current archbishop is the Most Reverend José S. Palma, DD, STh. D, who was installed on January 13,2011. The archdiocese honors Our Lady of Guadalupe de Cebú as its patroness while the second Filipino saint St. Pedro Calungsod as its patron saint. As of 2013, the archdiocese registered a total of 4,609,590 baptized Catholics and it is currently the largest archdiocese in the Philippines and in Asia having the most number of Catholics and priests. The Church anchored in that year by the native Cebuanos profession of faith in Christ, the celebration of the Mass. Pedro Balderrama being the pastor for their spiritual needs. However, immediately after its inception during the aftermath of Battle of Mactan, Most of the natives materially apostatized, while others clung unto the image of the Santo Niño. The unintended negligence lasted for 44 years until it was re-established in 1565 by the arrival of Miguel López de Legazpi, the oversight of the natives was succeeded to Fray Diego de Herrera who would re-baptized Tupas and his servants in 1568. Adelantado Miguel Lopez de Legazpi established his government in Cebu, thus the first capital of the Philippines, the Church of Panay The Church expanded from Cebu when the remaining missionaries led by Fr. Diego de Herrera when they were forced northwest temporarily due to conflict with the Portuguese, the Church of Camarines In 1570 the second batch of missionaries reached Cebu. The island became the seat as it was the center for evangelization. Alfonso Jimenez, O. S. A. who travelled and penetrated the Camarines region through the islands of Masbate, Samar and he was called the first apostle of the region. The Church of Manila By 1571, Fr, Herrera who was assigned as chaplain of Legazpi, from Panay advanced further north and founded the local Church community in Manila. The Christ Child, known as Divine Infant, Baby Jesus, Infant Jesus, Child Jesus, the Holy Child, and Santo Niño, refers to Jesus Christ from his nativity to age 12. Upon reaching 13 years-old he was considered to be an adult in accordance with Jewish custom, the canonical Gospels lack any narration of the years between Jesus infancy and the Finding in the Temple when he was twelve. 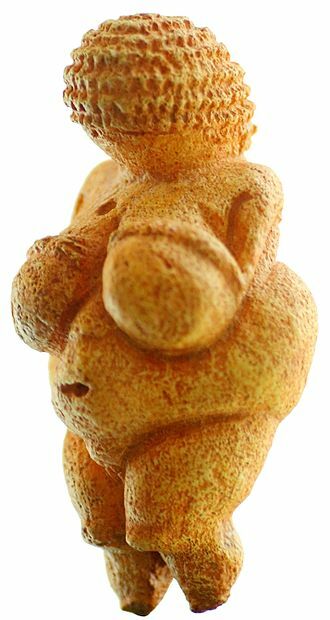 Commonly these are nativity scenes showing the birth of Jesus, with his mother, depictions as a baby with the Virgin Mary, known as Madonna and Child, are iconographical types in Eastern and Western traditions. Other scenes from his time as a baby, of his circumcision, presentation at the temple, the adoration of the Magi, scenes showing his developing years are more rare but not unknown. Saint Joseph, Anthony of Padua, and Saint Christopher are often depicted holding the Christ Child, the Christ Child was a popular subject in European wood sculpture beginning in the 1300s. 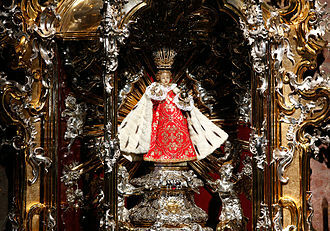 The popularity of the Christ child was known in Spain under the title Montanesino after the santero sculptor Juan Martínez Montañés who began the trend. The growth of images being made were quite popular among nobility, while images were used to colonize kingdoms such of Spain. The symbolism of the Child Jesus in art reached its apex during the Renaissance, tàladh Chrìosda is a Scottish carol from Moidart, Scotland. The Catholic priest Father Ranald Rankin, wrote the lyrics for Midnight Mass around the year 1855 and he originally wrote 29 verses in Scottish Gaelic, but the popular English translation is limited to five. The melody, Cumha Mhic Arois, is from the Hebrides and was a sung as a charm for the fisherman away at sea. The rhythm mirrors the rhythm of the surf and it is sung in the Hebrides at Midnight Mass of Christmas Eve. A number of texts, the Infancy Gospels grew up with legendary accounts of the intervening period. These stories were intended to show Jesus as having extraordinary gifts of power and knowledge, one common pious tale has the young Jesus animating sparrows out of clay belonging to his playmates. When admonished for doing so on the Sabbath, he causes the birds to fly away, in the seventeenth century veneration of the Christ Child under the title the Little King of Beaune was promoted by French Carmelites. The Kris (or Kalis), sacred swords used by uncolonized Filipinos, that were wielded as standard weapons. An old oil painting on the inside of a wooden chest, circa 1640-1650, depicting Intramuros, a walled city that was built over the burnt ruins of Bruneian controlled Maynila, center of the Spanish colony. Tintinnabulum and conopaeum, (Apostolic bell and umbrella) are unique ornamental privileges granted to Roman Catholic basilicas. Above picture is from the Minor Basilica of Our Lady of Consolation, Vilvoorde, Belgium. Reliquary at Pope St. John XXIII National Seminary in the United States, with relics of St. James, St. Matthew, St. Philip, St. Simon, St. Thomas, St. Stephen and other saints. Evangelical Lutheran church building in Štrba, Slovakia. A typical village church in Europe. La Madeleine, a Neoclassical, Roman Catholic church in Paris, France. 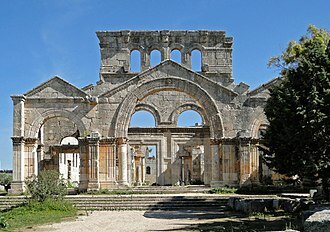 The Church of Saint Simeon Stylites in Aleppo, Syria, is considered to be one of the oldest surviving church buildings in the world. The Frauenkirche in Munich is a largely Gothic, medieval church. Ornate details on the entrance tower of Sri Mariamman Hindu Temple, Singapore. Larger-than-life structures remain at the ancient Egyptian Luxor Temple approximately 3400 years after it was built. An illustrated layout of the traditional interior of a Christian Orthodox church. The interior of the ancient Egyptian Karnak Temple. Concrete and metal rebar used to build a floor. Wooden church in Bodružal in Slovakia. This wall in Beacon Hill, Boston shows different types of brickwork and stone foundations. The Memorial stands in Urdaneta, Pangasinan ( a town named in his honor). The Santo Niño de Cebu, enshrined in the Philippines. Saint Anthony of Padua adoring the Christ Child. Oil on canvas, 1622 by Antonio de Pereda. The Strait of Magellan cuts through the southern tip of South America connecting the Atlantic Ocean and Pacific Ocean. Monument in Lapu-Lapu City, Cebu in the Philippines. Al-Maghtas ruins on the Jordanian side of the Jordan River are the location for the Baptism of Jesus and the ministry of John the Baptist. Cardinal Montini at the opening of the new building of the RAS, Milan, 1962. 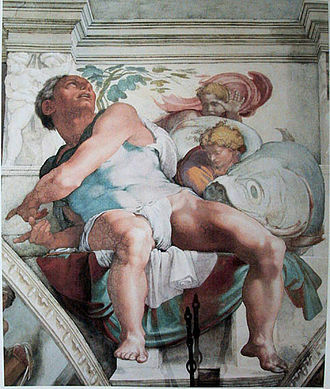 Photo by Paolo Monti. Carlo Maderno's monumental facade of Saint Peter's basilica in Vatican City. A Roman fresco of a young man from the Villa di Arianna, Stabiae, 1st century AD. 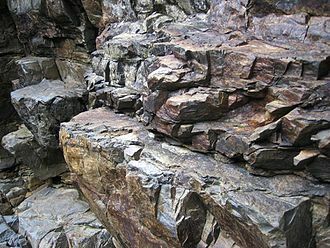 Rock outcrop at the shores of Lake Baikal, Russia. In the foreground a beach made of pebble-sized rocks can be seen. Rock outcrop along a mountain creek near Orosí, Costa Rica. Monastery of San Agustin of Yuriria, Mexico, founded in 1550. 1914 tour group led by Blasius Zeiser, OSA, on the deck of RMS Carpathia. Basilica Minore Sto. Niño, Cebu City. Door of the Schlosskirche (castle church) in Wittenberg to which Luther is said to have nailed his 95 Theses on 31st October 1517, sparking the Reformation. A 6th century Nestorian church, St. John the Arab, in the Assyrian village of Geramon. The Consecration of Deodat (1620, Claude Bassot). The consecration of Saint Genevieve, 1821 (Ste. Genevieve, Missouri). 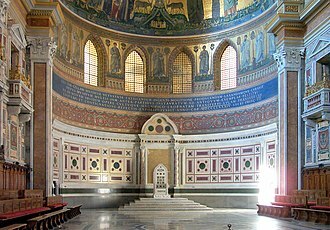 The papal throne (cathedra), in the apse of Archbasilica of St. John Lateran, symbolises the Holy See.